Virgin America Inc stock dropped more than 10% on Friday, but long-term investors shouldn't panic. On Thursday afternoon, Virgin America Inc (NASDAQ:VA) released the first investor update of its short life as a public company. 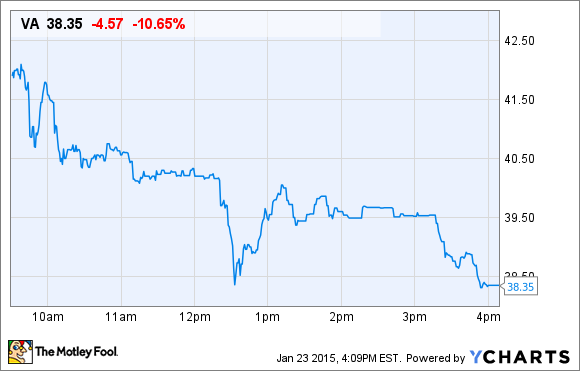 Investors clearly weren't pleased, sending Virgin America stock down more than 10% on Friday. It's true that some aspects of Virgin America's guidance were worse than expected. Unit revenue growth decelerated significantly in Q4 compared to the prior quarter. Virgin America also warned of significant non-fuel cost inflation in 2015. However, neither of these developments should be too concerning for long-term investors. This makes the drop in Virgin America stock a potential buying opportunity. Virgin America's Q4 revenue guidance was the first nugget of potentially disappointing information in its investor update. The company expects to report total unit revenue growth of 2.5%-3% in Q4. This represents a slowdown from total unit revenue growth of 5.5% in Q3 and 4.8% for the first 9 months of 2014. Still, this is better than what virtually every other U.S. carrier is reporting. Of the four airlines that dominate the U.S. market, Southwest Airlines led the way with unit revenue growth of just 2% in Q4. Furthermore, Virgin America's unit revenue slowdown was caused in part by its launch of new flights from Dallas Love Field to New York and Washington, D.C. in October. Virgin America ran some big introductory fare sales to create some buzz about these new routes, which probably weighed on Q4 unit revenue. It's quite typical for new routes to take a year or two (or even three) to mature to peak revenue levels. Unit revenue for the new Love Field routes should gradually improve throughout 2015, helping Virgin America continue posting better unit revenue growth than most of its competitors. Another cause of Virgin America stock's slide was the company's 2015 cost guidance. Virgin America announced that it will give its pilots a 15% raise in April -- probably a good move in light of the growing pilot shortage in the U.S. Most other workgroups will get 5% raises. Virgin America is also tweaking its 401(k) and profit sharing plans. The net result is that Virgin America expects non-fuel unit costs to rise 4%-6% this year. By contrast, most of the big airlines are pledging to keep non-fuel cost growth below 2%. Investors may be worried that Virgin America is going down the same path of JetBlue Airways and facing severe long-term cost pressure due to the aging of its workforce and fleet. Additionally, Virgin America had been paying about $10 million per quarter in interest prior to its IPO. However, the vast majority of its debt was paid off (or converted to Virgin America stock) as part of the IPO, which will dramatically reduce its interest expense in 2015. This should offset about three-quarters of the expected 2015 cost increases. One last potential cause of Virgin America stock's drop was its fuel price guidance. Virgin America has been hedging fairly aggressively for its near-term (6-9 months) fuel requirements. As a result, it didn't benefit that much from the rapid drop in oil prices during Q4. It also has locked in 66% of its Q1 fuel and 44% of its Q2 fuel at prices that are well above the current market price. Hedging losses are only a short-term problem, though. Virgin America has not done much hedging beyond Q2 so it stands to reap huge fuel cost savings in the second half of the year, assuming oil prices stay relatively low. Thus, the big sell-off in Virgin America stock on Friday was overdone. The company still has better unit revenue momentum than most of its competitors, which will allow it to overcome its non-fuel unit cost pressure this year. Meanwhile, lower fuel prices will drive significant margin expansion in 2015, particularly after Virgin America's fuel hedges run off around mid-year.